This might look like a double-bladed lightsaber, but these two cosmic jets actually beam outward from a newborn star in a galaxy near you. 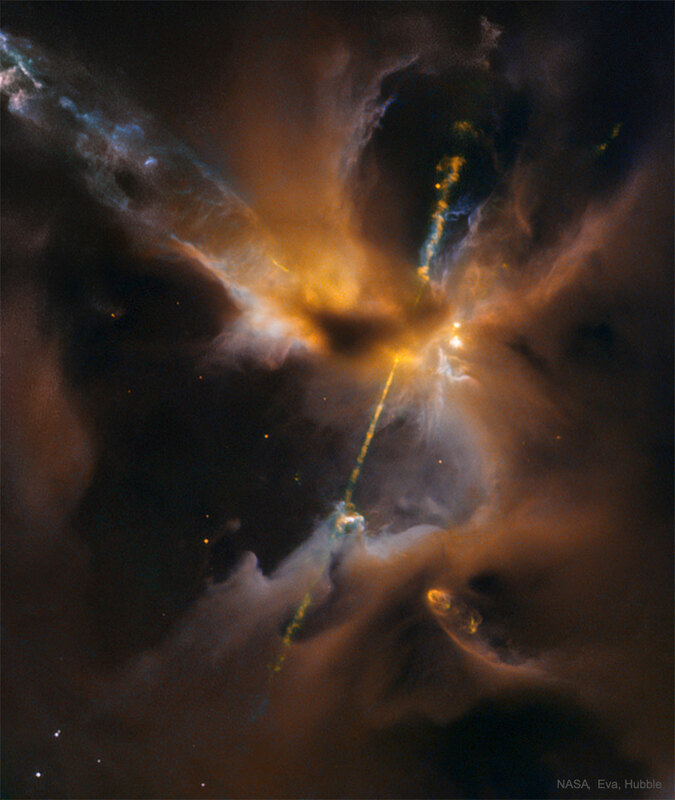 Constructed from Hubble Space Telescope image data, the stunning scene spans about half a light-year across Herbig-Haro 24 (HH 24), some 1,300 light-years away in the stellar nurseries of the Orion B molecular cloud complex. Hidden from direct view, HH 24’s central protostar is surrounded by cold dust and gas flattened into a rotating accretion disk. As material from the disk falls toward the young stellar object it heats up. Opposing jets are blasted out along the system’s rotation axis. Cutting through the region’s interstellar matter, the narrow, energetic jets produce a series of glowing shock fronts along their path. Duel is a word which means "a contest with deadly weapons arranged between two people in order to settle a point of honor." Perhaps you meant "dual" which means "consisting of two parts."